"The sluggish recovery from the Great Recession has been better for men than for women. From the end of the recession in June 2009 through May 2011, men gained 768,000 jobs and lowered their unemployment rate by 1.1 percentage points to 9.5%. Women, by contrast, lost 218,000 jobs during the same period, and their unemployment rate increased by 0.2 percentage points to 8.5%. These post-recession employment trends are a sharp turnabout from the gender patterns that prevailed during the recession itself, when men lost more than twice as many jobs as women. Men accounted for 5.4 million, or 71%, of the 7.5 million jobs that disappeared from the U.S. economy from December 2007 through June 2009. Employment trends during the recovery have favored men over women in all but one of the 16 major sectors of the economy." A flurry of news reports followed, including on the front page of the Washington Post ("Men, hit hardest in recession, are getting work faster than women"), at CNN Money ("Was the 'mancession' just a mirage? "), and most recently last Friday by Andrew Sullivan (Mancession Replaced with Hecovery"), who cites the Good Business blog saying that men "have gained 805,000 jobs, but women have lost a total of 281,000" since the recession ended. "Although the latest trends in employment are working in favor of men, the full period of the recession and the recovery has set men back more than women. From December 2007 to May 2011, the employment of men has decreased from 70.7 million to 66.1 million, or by 4.6 million. For women, employment has fallen from 67.3 million to 64.9 million, or by 2.4 million. Thus, while men have taken an early lead in the recovery, they still have far more ground to cover than women to return to pre-recession employment levels." 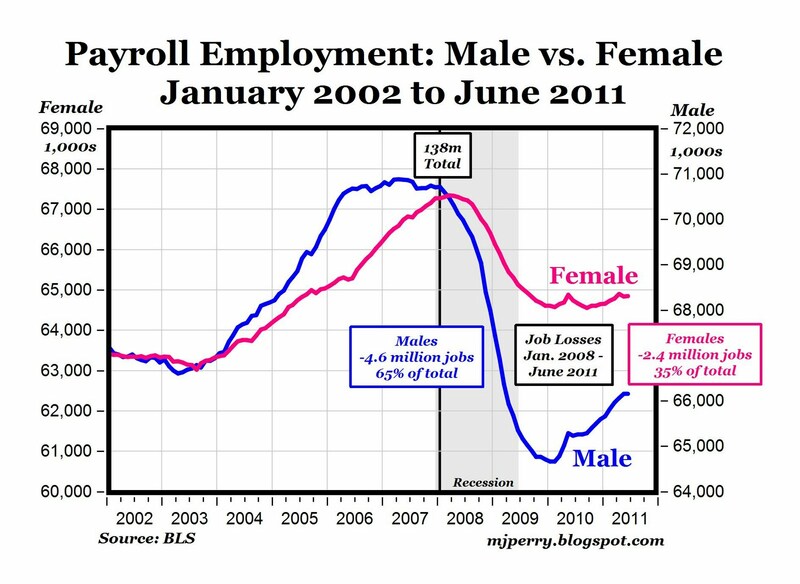 MP: The chart above helps to graphically illustrate the paragraph above by showing monthly employment levels for men and women from January 2002 to June 2011. 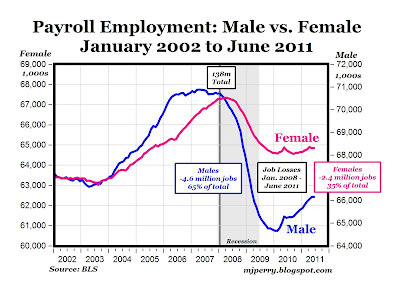 Although it's true that men have made greater employment gains since the recession ended, it's also true that men are still much worse off than women when we consider the entire period from January 2008 to June 2011. The current number of payroll jobs in the U.S. (131 million) is about 7 million jobs below the peak of 138 million jobs in January of 2008 when the recession was first starting. Of the 7 million jobs lost since 2008, men have lost 4.6 million or 65% of the total, compared to 2.4 million fewer jobs for women, or 35% of the total. Bottom Line: Despite the recent job gains for men since early 2010, the Great Recession has still had a disproportionately and significantly negative effect on men compared to women, and it's not even close: For every 100 jobs lost by women since January 2008, men have lost 192 jobs, so it's still very much of a "mancession," despite the recent "hecovery." Intomobile.com -- "Among the ever-growing number of iPhone accessories, we’ve spotted a new one which may pave the way to revolutionize the health care as we know it. It’s called Handyscope and by sticking it on the back of the device, it effectively turns an iPhone into a digital dermatoscope allowing for mobile skin examination. The accessory works in conjunction with an app that enables users to take a sample of their skin, which once a photo is taken, can be beamed directly to the physician to get his or her expert opinion." "One of the biggest selling features for 3D printers is the fact that you can just whip up a design using CAD software on your computer, then create a physical copy of it to try out - no special factory tooling required. Well, in order to illustrate the potential of the technology for the aviation industry, engineers from the University of Southampton have just designed and flown the world's first "printed" aircraft. The entire structure of the unmanned air vehicle (UAV) was created using an EOS EOSINT P730 nylon laser sintering machine, which builds up plastic or metal parts through a successive layering technique. The plane is named SULSA, for Southampton University Laser Sintered Aircraft. Once printed, the various parts of its body could simply be snapped together in a matter of minutes, without the use of tools. The resulting electric aircraft has a two-meter wingspan, an autopilot, and a top speed of almost 100 mph. In cruise mode, it is said to be almost silent. According to the Southampton researchers, it would normally take months to go from an initial aircraft concept to a flying prototype - using the laser sintering process, it could instead just take days. Because no production tooling is required, it also costs nothing to make changes to the finished aircraft's design, or to experiment with swapping in different parts." 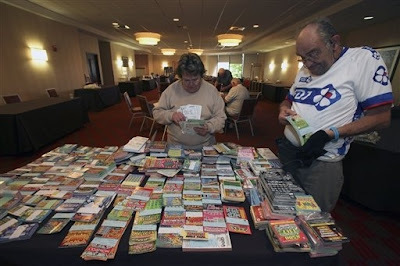 The Global Lottery Collector's Society, a worldwide group of enthusiasts who study and collect lottery tickets is having its 23rd Annual "Lotovention" this weekend in Philadelphia. Here's a USAToday article about the "lotologists." "More interesting is the shift over the last two decades of countries out of the bottom two groups and into the top two groups (see chart above). The number of Low-income and Lower Middle-income countries, often referred to as ‘developing economies’, is clearly diminishing." 1996: There were about 125 countries classified in the bottom two categories: Low (income per capita of $1,005 or less) or Lower/Middle ($1,006 to $3975 per capita income), and 80 countries classified in the top two categories: Upper Middle ($3,976 to $12,275) or High ($12,276 or higher). 2011: The number almost exactly reversed between the two lower and two higher groups: In 2001, there were only about 90 countries in the two low-income categories (vs. 125 in 1996) and 125 countries in the two high-income categories (vs. 80 in 1996). Bottom Line: In just the 15-year period between 1996 and 2011, there were about 40 countries that moved from the two lower income groups to the two high-income categories, which is about 20% of the countries in the world that moved from "developing economy" status in 1996 to Upper Middle/High Income status by 2011. We could say that in 1996, the World Bank classified about 58% of the world's economies as low-income or "developing," and by 2011 that percentage had fallen to only 39%. Yes, the world is clearly getting richer, as Don points out. Related: See this November 2009 CD post "New Study Shows Significant Drop in World Poverty." 2. The trade deficit as most people understand it doesn’t exist. 3. Trade deficits are most often associated with periods of strong U.S. economic growth—not decline. 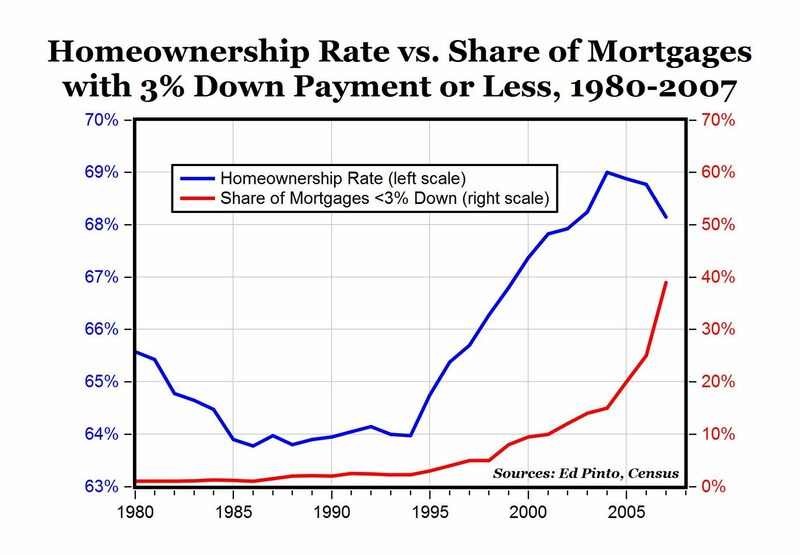 The chart above appeared on this recent CD post showing the close historical relationship between: a) the U.S. homeownership rate, and b) the share of mortgages for home purchases with a 3% down payment or less (97% loan-to-value ratio or higher), especially starting in about 1995 when they both increased sharply. "3%! Simply amazing. 3% isn’t even close to serious. 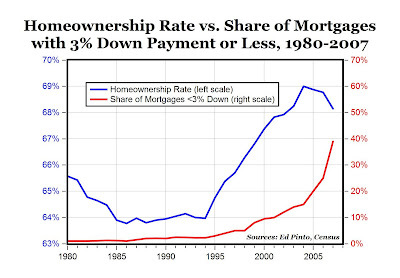 If you are only able or willing to put down 3% you simply aren’t serious about homeownership. It’s laughable. 3% would have gotten you laughed out of any bank in America prior to 1994. 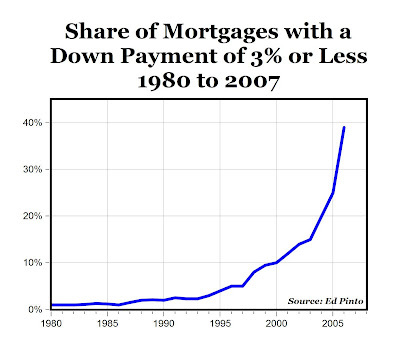 Yet by 2007 40% of all mortgages had less than 3% downpayments. It’s additionally frightening to wonder what that number would be for less than 4% down or 5% down, still totally laughable and un-serious levels of equity. 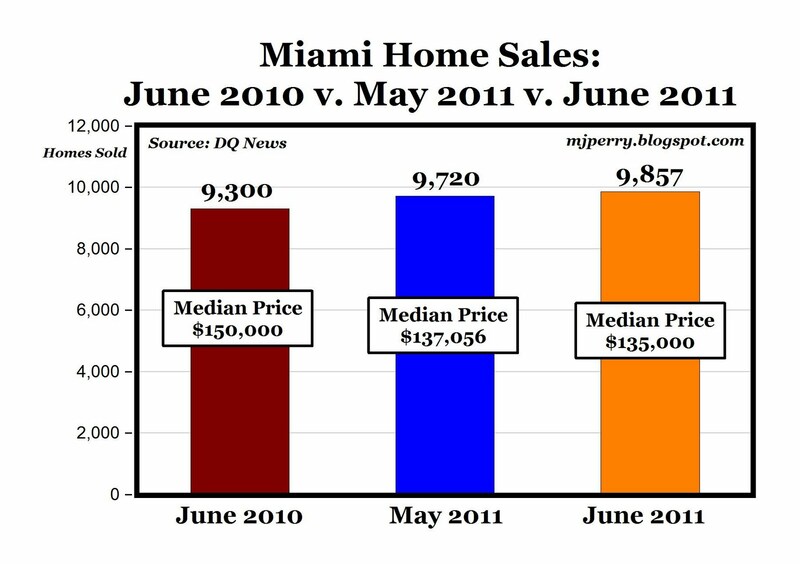 I have said it for awhile – mortgage lending to creditworthy home buyers has been a stable, profitable, and boring business in the United States of America for about a hundred years; so for those who blame “Wall Street greed” for the crisis, I ask you “why now?” Why did greed not appear, not infect the system, not attempt to seize filthy lucre for that hundred years? Why did greed only show up at that particular moment in time? I further ask why did greed not make its way to Canada, where they did not have a housing and/or banking crisis? Is greed only a US and highly time specific phenomenon? The answer is that government embarked, at the urging of “social justice” activists, on a policy campaign to degrade the prudential standards that prevailed in the housing lending market. 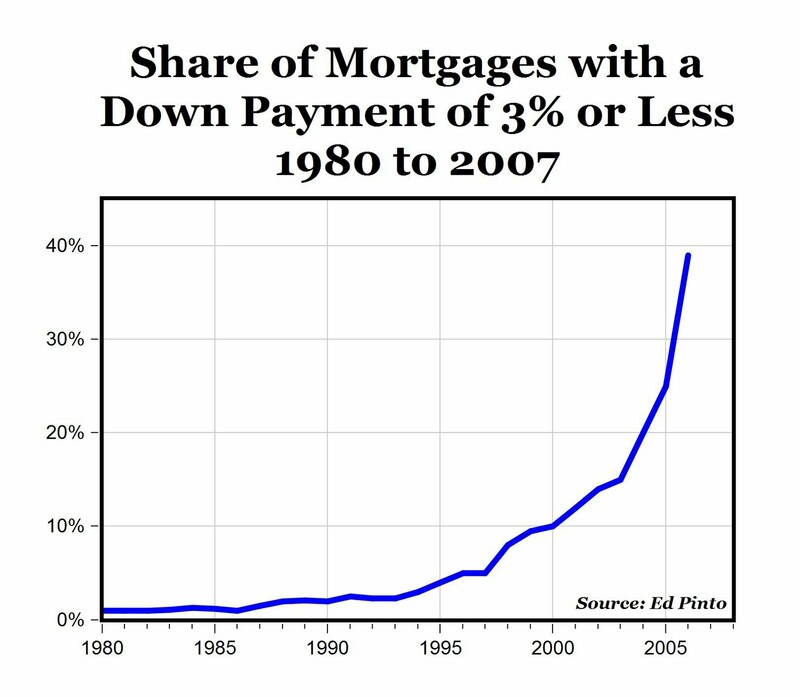 The government effectively demanded and enforced irresponsible lending, and they got it. Unfortunately the government can’t repeal the iron laws of economics, so what they got was a flimsy, risk-infected financial system that was bound to crash, which it did." Sunday, July 31 will be Milton Friedman's 99th birthday. 1. Video: Visualizing the national debt using a kiddy pool. 2. Remy rap video on raising the debt ceiling. 4. Video ad: "Washington can learn a lot from a drug addict." In the 1920s, H.L. Mencken said "The whole aim of practical politics is to keep the populace alarmed (and hence clamorous to be led to safety) by menacing it with an endless series of hobgoblins, all of them imaginary." INDIANAPOLIS -- "Drivers attending the Indiana State Fair or a major sporting event downtown may sometimes opt to grab a parking spot in someone's yard rather than pay higher prices in a parking lot, but some city officials think people who provide parking spots should get a permit first. City leaders are proposing that residents pay a $75 fee (per event) if they want to turn their yards into parking lots." A new lawsuit was filed today by The Institute for Justice (IJ) to challenge Atlanta's unconstitutional vending monopoly on behalf of two Atlanta street vendors (see video above and go here and here for full background information, excerpts appear below). "Should the city of Atlanta be allowed to create a single street vending monopoly that forces existing vendors to start paying up to $20,000 in rent and fees every year? That is the question to be answered by a major lawsuit filed today by the Institute for Justice - a national civil liberties law firm - and two well-known Atlanta vending entrepreneurs: Larry Miller and Stanley Hambrick. Practiced since ancient times, street vending is more popular than ever. The Economist magazine predicted that this year “some of the best food Americans eat may come from a food truck.” For generations, street vending has been a classic way for entrepreneurs to provide for themselves and their families while creating jobs and satisfying customer demands. But two years ago, Atlanta handed over all public-property vending to a single company—the first program of its kind in the country. Now that company wants to throw Larry Miller and Stanley Hambrick out of the spots they have worked for over a decade to build kiosks that rent for almost $20,000 a year. If it succeeds, Larry and Stanley’s businesses will be destroyed. To protect the economic liberty of all Georgians, Larry and Stanley have joined with the Institute for Justice to challenge Atlanta’s vending monopoly. This lawsuit, filed today in the Superior Court for Fulton County, Georgia, is the second case in the Institute’s National Street Vending Initiative. It argues that Atlanta lacks the power to grant an exclusive vending franchise and that its actions violate the Georgia constitution. A victory will not only free Atlanta’s vending community; it will make other cities think twice before entering into similarly anticompetitive arrangements." "With the abysmal recent jobs report, it's tempting to point to flat hiring as another example of the federal government's impotence at stimulating growth. Lost amid the hand-wringing and focus on Washington, D.C., however, is the unhelpful role of state governments in making joblessness worse. Their harmful method is occupational licensure. By imposing onerous and usually pointless requirements on those wishing to enter a trade or line of work, state legislatures erect needless barriers around occupations perfectly suited for those entering the work force, midcareer switchers, and pink-slip recipients. Only one in 20 workers needed the government's permission to pursue their chosen occupation in the 1950s, notes University of Minnesota Prof. Morris Kleiner. Today that figure is nearly one in three (see chart above from a related February 2011 front page WSJ article "A License to Shampoo: Jobs Needing State Approval Rise"). The Institute for Justice is examining the licensing requirements of 100 occupations across all 50 states and the District of Columbia. The occupations are those that pay less than the median income and are sufficiently established to be recognized by the Bureau of Labor Statistics. What we have found paints a stupefying picture of irrational regulation with pernicious effects. Conclusion: Instead of looking to the federal government to create jobs, state legislatures could have a real and immediate effect on unemployment in their states by showing how less truly is more. They can remove the barriers to job creation that their predecessors erected and enjoy the job-generating drive of their states' aspiring entrepreneurs." "How many deaths have resulted [from CAFE standards]? Depending on which study you choose, the total ranges from 41,600 to 124,800. To that figure we can add between 352,000 and 624,000 people suffering serious injuries, including being crippled for life. In the past thirty years, fuel standards have become one of the major causes of death and misery in the United States -- and one almost completely attributable to human stupidity and shortsightedness." "The Oracle of Omaha is at it again. On July 7, Warren Buffett told Bloomberg: "I think the rich have a responsibility to pay higher tax rates." Then he groused that his wealthy friends are "paying lower tax rates than the people who are serving us the food." Mr. Buffett has been voicing this complaint for years, once observing that his personal tax rate of 17.7% is lower than that of his receptionist (30%). During Monday night's national address, President Obama recited the Buffet line that millionaires and billionaires pay lower tax rates than their secretaries. Democrats in Congress routinely cite Mr. Buffett's tax confessions as irrefutable evidence that tax rates on the very rich are too low and the system is unfair. And the system would be unfair, if Mr. Buffett's tax facts were the whole truth. But they aren't. I don't know the details of Warren Buffet's personal taxes, and he hasn't made them public. But the IRS does provide reliable data on effective tax rates—the overall share of their income that various groups pay in federal income taxes (not including state or local taxes) after accounting for all deductions and exemptions. These are different than marginal tax rates, which are paid on the next dollar of income and now peak at 35% for individuals. 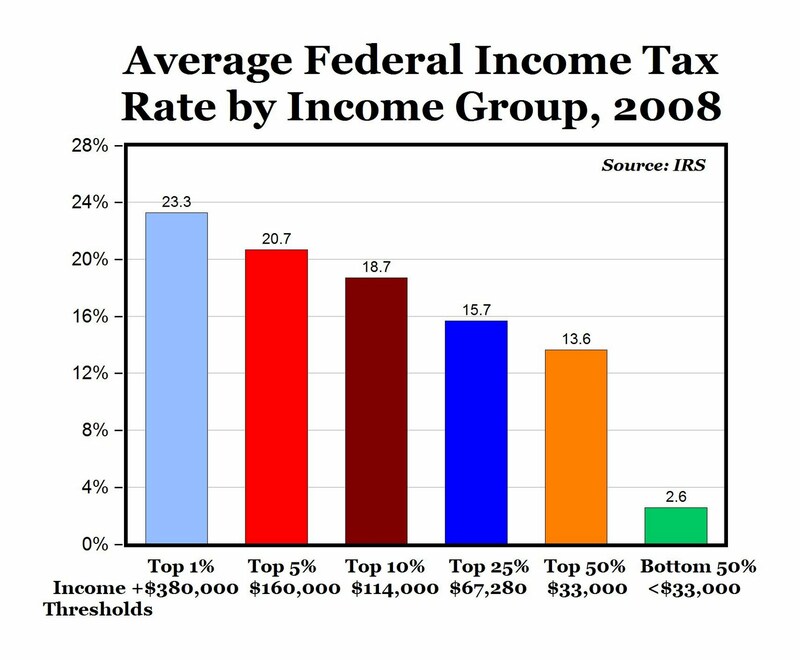 IRS data for 2008, for example, show that households in the top 10% of earners (above about $114,000) paid 19% of their income to the feds (see chart above). Those in the top 1% (above $380,000) paid 23.3%. The top 0.1% of earners, with incomes of $2 million or more, end up paying a slightly lower tax of 22.7%, because they get more of their income from investments (more about this below). So what about the rest of us? 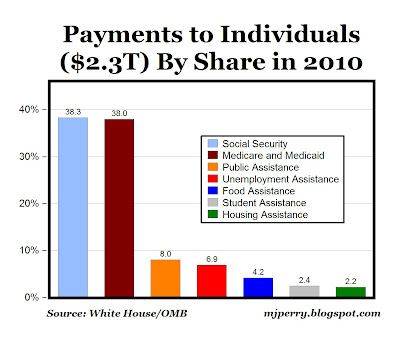 According to IRS data, a median-income household ($35,000) in 2008 paid about 4% of its income in federal income tax." 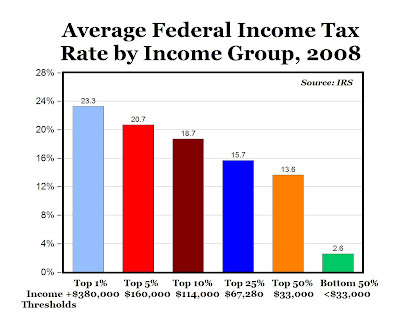 MP: The chart above shows that the U.S. income tax system is progressive (as it's intended to be) and higher income groups pay taxes at a higher rate on average, as a share of their taxable income. For the bottom 50% of taxpayers with incomes of $33,000 or less, the average tax rate is only 2.6%. As I have mentioned several times before, if Warren Buffett thinks he should pay higher taxes, he doesn't have to wait for the Bush tax cuts to expire, he can pay higher taxes right now by making a gift to the U.S. Treasury, instructions are here. In their new book "Reckless Endangerment," authors Morgenson and Rosner offer considerable censure for reckless bankers, lax rating agencies, captured regulators and unscrupulous businessmen. 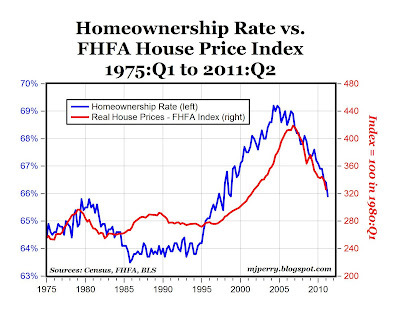 But the greatest responsibility for the collapse of the housing market and the near "Armageddon" of the American economy belongs to Fannie Mae and Freddie Mac and to the politicians who created and protected them. With a couple of prominent exceptions, the politicians were Democrats claiming to do good for the poor. Along the way, they enriched themselves and their friends, stuffed their campaign coffers, and resisted all attempts to enforce market discipline. When the inevitable collapse arrived, the entire economy suffered, but no one more than the poor. Fannie Mae lied about its profits, intimidated adversaries, bought off members of Congress with lavish contributions, hired (and thereby co-opted) academics, purchased political ads (through its foundation) and stacked congressional hearings with friendly bankers, community activists and advocacy groups (including ACORN). Fannie Mae also hired the friends and relations of key members of Congress (including Rep. Barney Frank's partner). "Reckless Endangerment" includes the Clinton administration's contribution to the home-ownership catastrophe. Clinton had claimed that dramatically increasing homeownership would boost the economy, instead "in just a few short years, all of the venerable rules governing the relationship between borrower and lender went out the window, starting with ... the requirement that a borrower put down a substantial amount of cash in a property, verify his income, and demonstrate an ability to service his debts." "Reckless Endangerment" utterly deflates the perceived history of the 2008 crash. Yes, there was greed -- when is there not? But it was government distortions of markets -- not "unregulated capitalism" -- that led the economy to disaster." 1. World trade volume increased by 2.3% in May from the previous month, following a decrease of 2.2% in April. Imports of all major regions and countries increased strongly. However, exports of the emerging countries declined further with the exception of Latin-America. Exports of the advanced economies recovered to the highest level since the outbreak of the financial crisis, but are still 4% down on the pre-crisis peak. 2. 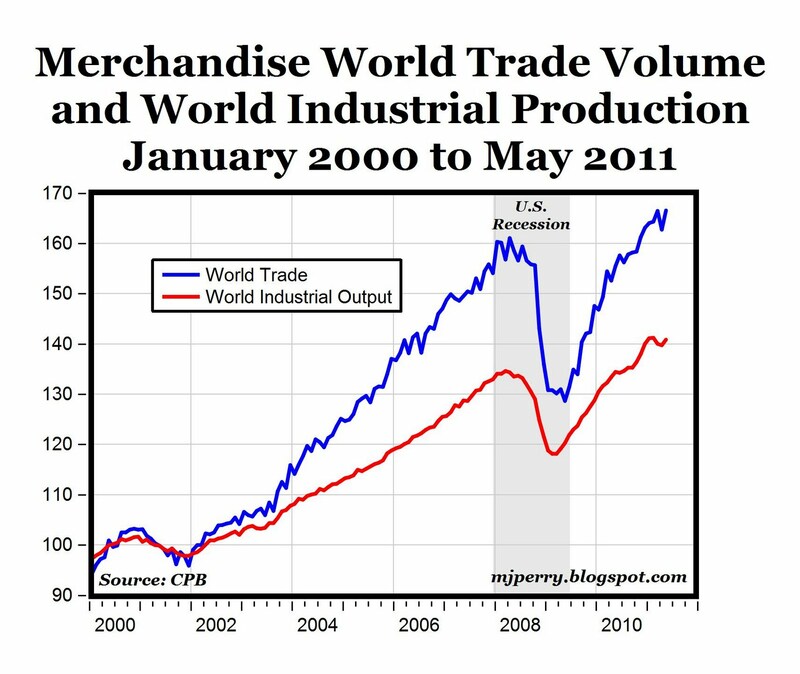 On an annual basis, world trade volume was above its year-ago level by 7.14%. 3. World industrial production recovered as well in May by 0.8% from the previous month, following a slightly revised 0.2% decline in April. Half of the rise was due to the ongoing recovery in Japan, with a mixed picture for the other major countries and regions. 4. Compared to May of last year, world industrial output gained almost 5% (4.76%), and is almost 6% (5.94%) above the pre-recession level in December 2007. 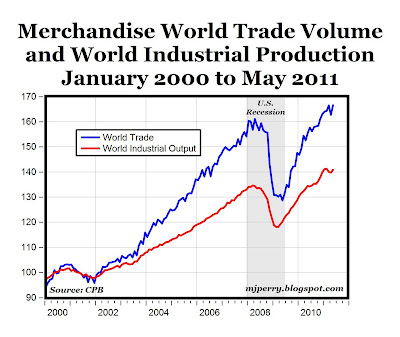 Bottom Line: We still face many economic uncertainties (and they sure spooked the market today), but the upward trends in both world trade and output through May to levels above their pre-recession levels suggests a worldwide economic recovery from the dreadful economic conditions of 2008 and 2009. If the upward trends in trade and output continue, we can look forward to a gradually improving world economy. But if the economic headwinds continue to accumulate, we could be looking at a slowdown in Q3 and Q4. 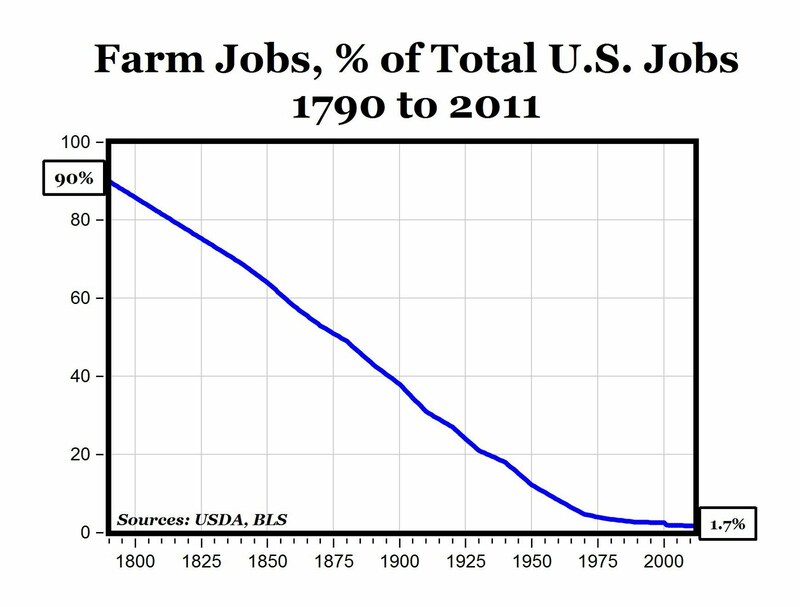 "In 1790, farmers were 90 percent, out of a population of nearly 3 million, of the U.S. labor force. 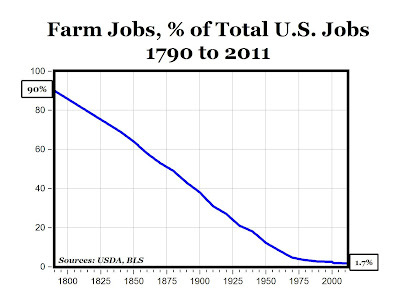 By 1900, only about 41 percent of our labor force was employed in agriculture. By 2008, fewer than 3 percent of Americans were employed in agriculture (MP: see chart above, farm jobs as a share of the labor force is now below 2%). Through labor-saving technological advances and machinery, our farmers are the world's most productive. As a result, Americans are better off. If 90 percent of Americans still had been farmers in 1900, where in the world would we have gotten workers to produce all those goods that were not even heard of in 1790, such as telephones, steamships and oil wells? We need not go back that far. If there hadn't been the kind of labor-saving technical innovation we've had since the 1950s -- in the auto, construction, telephone industries and many others -- where in the world would we have gotten workers to produce things that weren't heard of in the '50s, such as desktop computers, cellphones, HDTVs, digital cameras, MRI machines, pharmaceuticals and myriad other goods and services? What technological innovation does is reduce the value of some jobs, raise the value of others and create many more jobs. Some workers are made better off through greater employment opportunities. Others are made worse off by having to accept less attractive employment opportunities, an adjustment process that can be painful. Since technological progress makes goods and services cheaper, and of higher quality, to stand in its way, in the name of saving jobs, will make us a poorer nation. What we're witnessing in our economy is what economic historian Joseph Schumpeter termed "creative destruction," the process in which something new replaces something older." The American Trucking Association reported yesterday that its truck tonnage index, a key barometer of economic activity, increased 6.8% in June from a year ago, the largest annual gain since an 8% increase in January. On a monthly basis, truck tonnage in June was 2.8% higher than May. (Los Angeles, CA) – "Today the NAACP passed a historic resolution calling for an end to the "War on Drugs." The resolution was voted on by a majority of delegates at the 102nd NAACP Annual Convention in Los Angeles, CA. The overall message of the resolution is captured by its title: "A Call to End the War on Drugs, Allocate Funding to Investigate Substance Abuse Treatment, Education, and Opportunities in Communities of Color for A Better Tomorrow." The resolution outlines the facts about the failed drug war, highlighting that the U.S. spends over $40 billion annually on the war on drugs, locking up low-level drug offenders – mostly from communities of color. African Americans are in fact 13 times more likely to go to jail for the same drug-related offense than their white counterparts. MP: Seems like a no-brainer. 1. "In the late-1980s and early-1990s ACORN and other community groups claimed that Fannie and Freddie were standing in the way of their efforts to replace traditional underwriting with flexible underwriting. They lobbied Congress to force the Government Sponsored Enterprises (GSEs) to abandon their traditional underwriting standards. The goal was to force the GSEs to replace their conservative underwriting standards with flexible ones, knowing that this would spur the rest of the market to do the same. 2. These community groups were successful in convincing Congress to impose affordable housing (AH) mandates on Fannie and Freddie. This set in motion 14 years of ever looser loan standards. 3. Fannie embraced AH mandates in order to buy the political protection it would use to defeat any unwelcome changes to its lucrative charter benefits. To this purpose, it vows to “transform” the housing finance system. 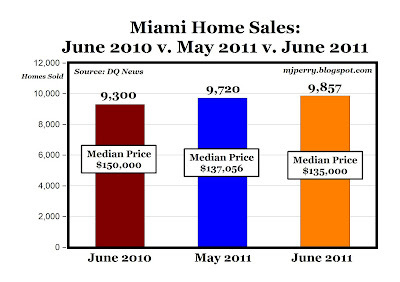 The strategy worked–Fannie was politically unassailable until 2008. 4. The government implements the National Homeownership Strategy with the goal of replacing traditional underwriting with flexible standards. 5. 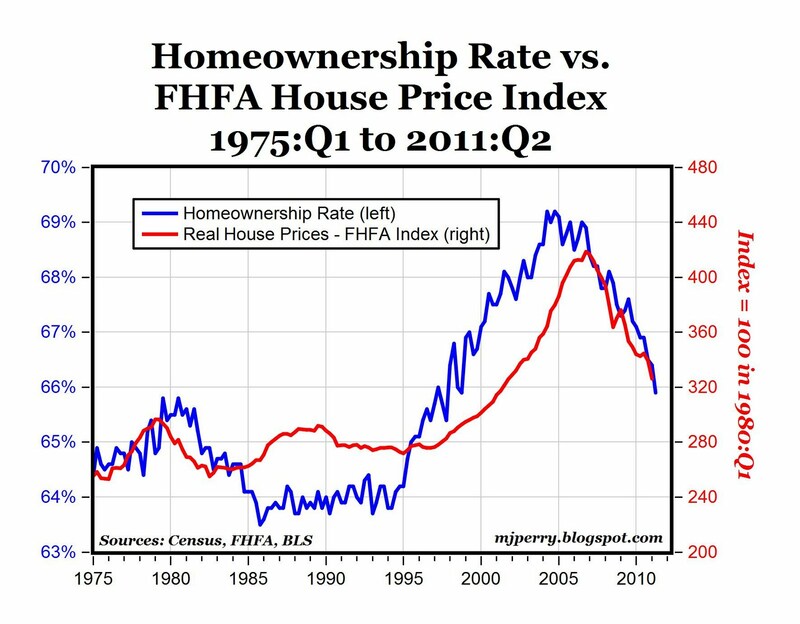 Dissenting voices (AEI's Peter Wallison among them) predicted that these efforts to transform housing finance would end in disaster. 6. As flexible lending expands, the volume and risk characteristics of so-called prime loans increases markedly, yet these loans were still called prime. For example, loans with no downpayment acquired by Fannie are called prime merely because Fannie is now willing to acquire them. The same logic applies to loans with impaired credit. HUD acknowledges this in a 2000 rule making. "Every Saturday in the fall, we pack college stadiums, raise the American flag, stand quietly as a marching band plays The Star-Spangled Banner, and cheer for a sport that prohibits capitalism. College athletes cannot be paid. Every American knows this. The concept is as entrenched in our bloodstreams as cholesterol. We have accepted it for so long, and gone along with the NCAA's definition of right and wrong for so many years, that we don't even remember the reasons anymore. They can't be paid because they can't be paid, because they just can't, because it's not allowed, because if it were allowed, then they could be paid. And they can't. Because it's not allowed. Got it? Some day, we will look back on this era of college sports the way we look back on Prohibition. We'll see that there were some good intentions behind it, along with some misguided fears. The problem with amateurism in college sports is the same problem the nation had with Prohibition: It is impossible to enforce. The simple fact is that college athletes want to get paid (who wouldn't?) and there are literally thousands of people out there who would like to pay them. Why are we stopping this? What is the big deal? What do you think would happen if your starting quarterback was allowed to take $100,000 from somebody who enjoyed watching him play? Would the Earth crash into the sun? Should college athletes be paid? That's not really the question. No, the question is this: Should college athletes be a allowed to be paid? Should they be allowed to take money for doing something perfectly legal? Of course they should. In America in 2011, why are we even debating this?" Despite concerns by many that inflationary pressures are building in the U.S. economy, the table above shows price changes for products that have experienced deflation over the last year (June to June). In most past periods of inflation, like the 1970s, it was usually the case that almost ALL prices were increasing. The fact that we now have a period of mixed price changes (some rising, some falling and some flat) might suggest that the concerns about inflation are somewhat misplaced and overblown. 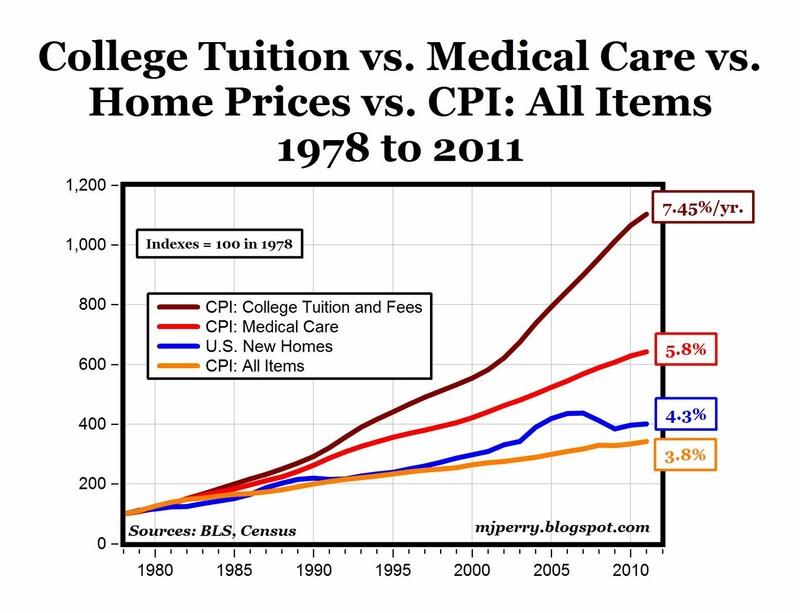 The chart above illustrates graphically the "higher education bubble" by comparing the annual increases in the CPI for "College tuition and fees" (7.45% per year since 1978) to annual increases in the CPI for "medical care" (5.8% per year since 1978) to annual increases in the median price for new homes (4.3% per year) to the annual increases in the "CPI for all items" (3.8% per year). I would have to check to verify this, but I'm not sure there is any other item in the CPI that has gone up faster since the 1970s than "college tuition and fees." We hear a lot about rising medical costs, but those increases (5.8% per year from 1978 to 2011) are relatively minor compared to the increases in tuition (7.45% per year over the same period). As as you can see from the graph, tuition increases have accelerated over the last decade. 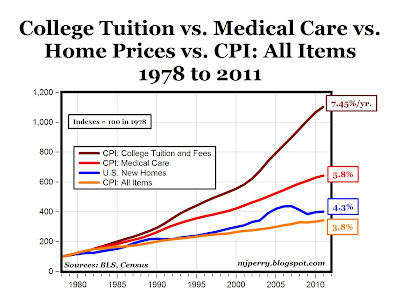 Since 2000, college tuition costs have doubled while medical costs have gone up by "only" about 52%. Read more about the unsustainable "higher education bubble" at The Enterprise Blog. "According to figures published by research charity the RAC Foundation last week, the second quarter of the year saw just 215 cars bought under the government's Electric Vehicle grant scheme, which knocks £5,000 (about $8,200) off the price of a new electric car. This contrasts with 465 taken up in the first three months of the year, and takes the total of cars bought under the scheme to 680, leaving the U.K.'s electric fleet still struggling to top 2,500 vehicles (out of a car fleet of 28 million). The low uptake means just £3.4m ($5.57m) of the £43m ($70.44m) put aside by the government until the end of March 2012 has been spent." Note: Gasoline retails for about $9 per gallon in the U.K.
"The national debt-ceiling law should be judged by what it actually does, not by how good an idea it seems to be. 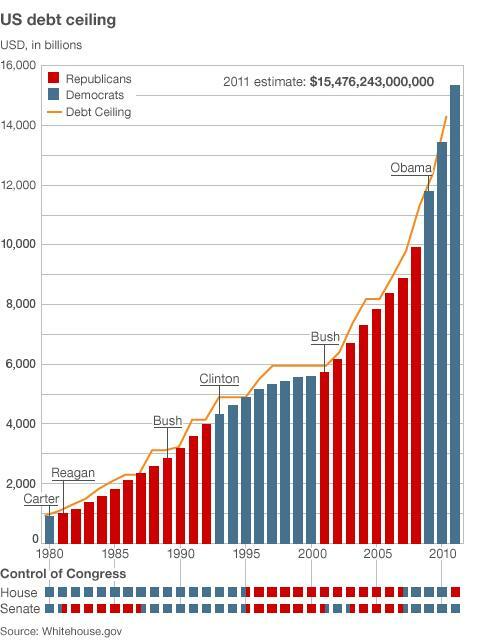 The one thing that the national debt-ceiling has never done is to put a ceiling on the rising national debt. 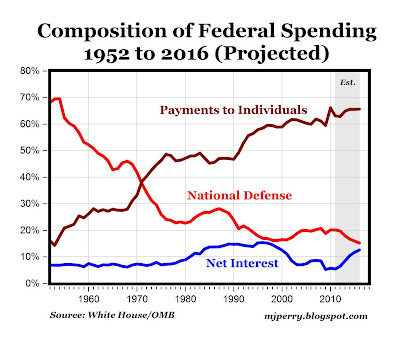 Time and time again, for years on end, the national debt-ceiling has been raised whenever the national debt gets near whatever the current ceiling might be (see chart above, courtesy of today's "The Gartman Letter"). Regardless of what it is supposed to do, what the national debt-ceiling actually does is enable any administration to get all the political benefits of runaway spending for the benefit of their favorite constituencies -- and then invite the opposition party to share the blame, by either raising the national debt ceiling, or by voting for unpopular cutbacks in spending or increases in taxes. The Obama administration is a classic example. When all its skyrocketing spending bills were being rushed through Congress without even being read, the Democrats had such overwhelming majorities in both the Senate and the House of Representatives that Republicans had all they could do to get a word in edgewise -- even though their words had no chance of stopping, or even slowing down, the spending of trillions of dollars. 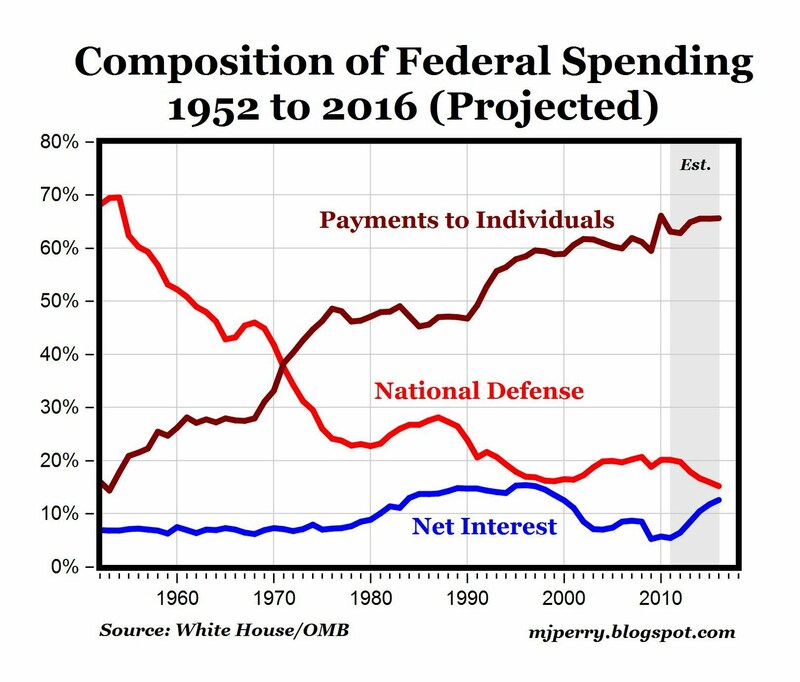 Those who got the political benefits from handing out trillions of dollars of the taxpayers' money (plus borrowed money) would also get the clear and sole blame for the resulting skyrocketing national debt and all the unpopular consequences." "The Kaukauna School District, near Appleton, Wisconsin, has about 4,200 students and about 400 employees. It has struggled in recent times and this year faced a deficit of $400,000. But after the new law went into effect on June 29, school officials put in place new policies they estimate will turn that $400,000 deficit into a $1.5 million surplus. And it's all because of the very provisions that union leaders predicted would be disastrous. It is impossible to overstate how bitter and ugly the Wisconsin fight has been, and that bitterness and ugliness continues to this day with efforts to recall senators and an unseemly battle inside the state Supreme Court. But the new law is now a reality, and Gov. Walker recently told the Milwaukee Journal Sentinel that the measure will gain acceptance "with every day, week and month that goes by that the world doesn't fall apart." In the Kaukauna schools, the world is not only not falling apart -- it's getting better." "Neuticles are a patented, revolutionary testicular implant procedure for pets. Over 425,000 caring pet owners worldwide have selected Neuticles as a safe, practical and inexpensive option when neutering their beloved pet. Neuticles allows your pet to retain his natural look, self-esteem and aids in the trauma associated with altering." Neuticles: "It's Like Nothing Ever Changed"
Flip-flops.... they used to be for the beach only..... Now we've become "Flip-Flop Nation" and They're Everywhere ... Workplace, hotel lobbies, airplanes, shopping malls, restaurants, museums. "To what extent can we consider the popular vote for the House in off-year elections as a prediction of the presidential vote in the next election? The answer appears to be: pretty good. The chart above shows the Republican and Democratic percentages for the House popular vote and for the presidential popular vote, starting with 1994. In the three most recent cases, the off-year percentages for the House are almost exactly the same as the presidential year percentages for president. However, Republicans signally failed to replicate their 1994 House percentage in the 1996 presidential contest. They would have been closer if 6% of the 8% cast for independent candidate Ross Perot is counted for Republican nominee Bob Dole—who polls suggested was the second choice of the overwhelming percentage of Perot voters—but that would still have left Clinton ahead 51%-47%. Absent a considerable redefinition by the incumbent president, he or his party’s nominee is likely to run just about as well (or poorly) in the next presidential election as his party’s House candidates did in the most recent off-year elections. Obviously, the three most recent examples portend an unhappy 2012 for President Obama and the Democrats, while the 1994-1996 example is a precedent for an incumbent Democratic president overcoming a “thumping” (George W. Bush’s term) in the off-year and winning reelection by a nontrivial margin. What I think these numbers suggest is that, absent a considerable redefinition by the incumbent president, he or his party’s nominee is likely to run just about as well (or poorly) in the next presidential election as his party’s House candidates did in the most recent off-year elections. The off-year vote represents a settled opinion on how the president and his party have performed in nearly two years in office, and unless the president takes a significantly different course toward governing, as Bill Clinton arguably did in 1995-1996, then that settled verdict remains more or less in place. Or so the numbers suggest." 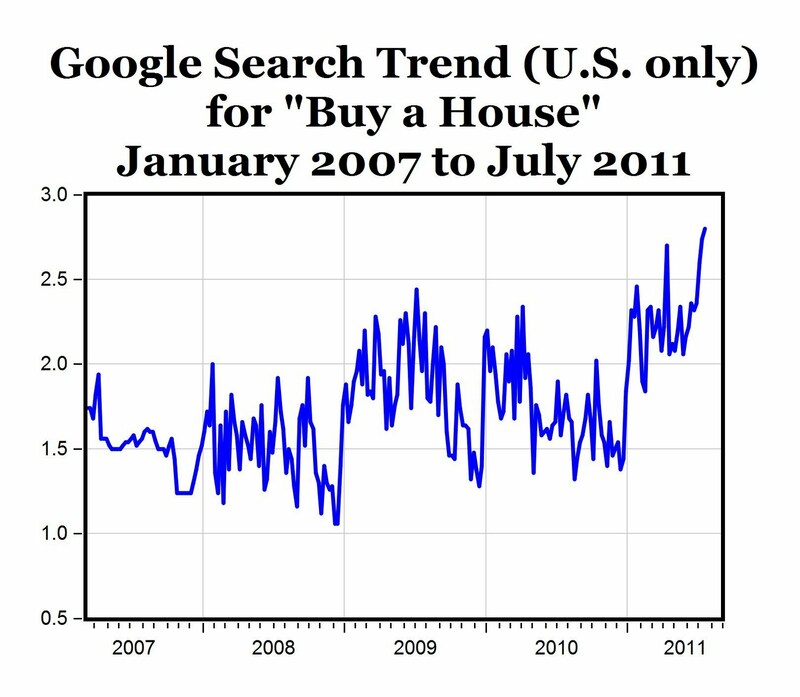 The chart above shows the Google Trends online search volume for the term "buy a house" (for the U.S. only) back to 2007. This was one of the "uncommon economic indicators" featured on a CNBC segment this morning featuring Nick Colas, Convergex Group Chief Market Strategist, who reported this as the most optimistic of the five uncommon indicators discussed. 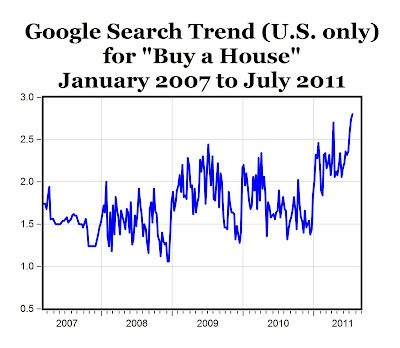 Searches for the terms "buy a house" and "buy a home" are reaching post-crisis highs on Google Trends (see chart above), and could be a leading indicator of home purchases six months to a year in the future. The Chronicle of Higher Education released a report today "Great Colleges to Work for 2011" based on responses from nearly 44,000 people at 310 institutions. The University of Michigan-Ann Arbor made the list, and its profile included the institutional details displayed in the chart above: 9,652 full-time administrators and professionals vs. 6,305 full-time faculty and 1,260 part-time faculty. 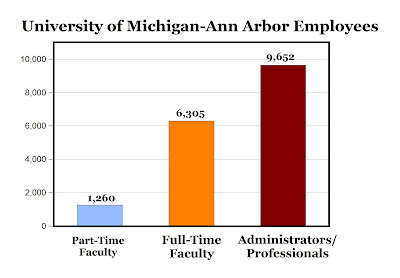 In other words, there are 53% more full-time administrators than full-time faculty. Is this evidence of "administrative blight?" Note: The data above from the Chronicle of Higher Education was preliminary. The final 2011 numbers reduced the "Administrators" category from 2,415 to 1,893. The final numbers also reduced "Exempt Professionals," a category that includes all exempt employees in instruction, research and student support, from 7,237 to 4,915. The accurate comparison of administrators to full-time faculty is not 9,652 administrators divided by 6,305 full-time faculty: 153%, but rather 6,808 administrators divided by 6,305 full-time faculty: 108%. 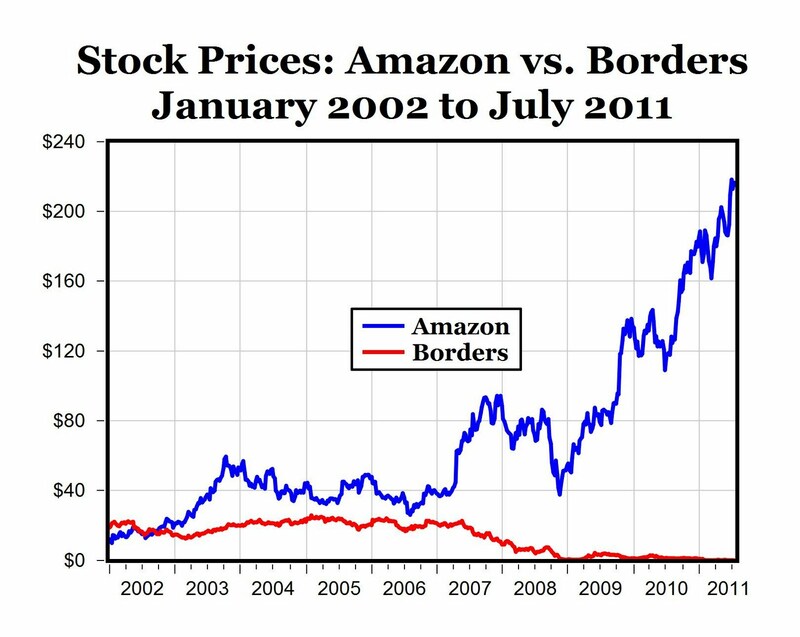 In early January 2002, Borders stock was selling at $21.48 per share, more than twice the price of Amazon shares at $10.16 (see chart above). 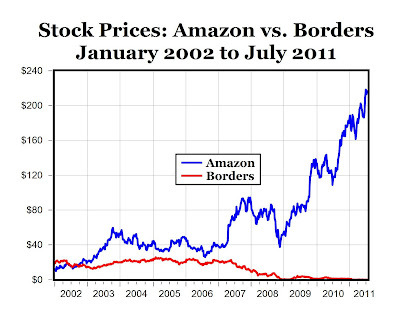 Now Amazon is selling for $216.52 and Borders is selling for $0.02. Q: When you look at the big picture, where should we be focusing besides nuclear? On massive solar plants in the desert? On middle-size stuff for office roofs? Or is there a reinvention that could be done right in the home? Bill Gates: If you’re going for cuteness, the stuff in the home is the place to go. It’s really kind of cool to have solar panels on your roof. But if you’re really interested in the energy problem, it’s those big things in the desert. Rich countries can afford to overpay for things. We can afford to overpay for medicine, we can overpay for energy, we can rig our food prices and overpay for cotton. But in the world where 80 percent of Earth’s population lives, energy is going to be bought where it’s economical. People are going to buy cheap fertilizer so they can grow enough crops to feed themselves, which will be increasingly difficult with climate change. You have to help the rest of the world get energy at a reasonable price to get anywhere. It’s great to have the rich world, because we’re there to think about long-term problems and fund the R&D. But we get sloppy, because we’re rich. For example, despite often-heard claims to the contrary, ethanol has nothing to do with reducing CO2; it’s just a form of farm subsidy. If you’re using first-class land for biofuels, then you’re competing with the growing of food. And so you’re actually spiking food prices by moving energy production into agriculture. For rich people, this is OK. For poor people, this is a real problem, because their food budget is an extremely high percentage of their income. As we’re pushing these things, poor people are driven from having adequate food to not having adequate food. About solar: I think people deeply underestimate what a huge problem this day-night issue is if you’re trying to design an energy system involving solar technology that’s more than just a hobby. You know, the sun shines during the day, and people turn their air conditioners on during the day, so you can catch some of that peaking load, particularly if you get enough subsidies. It’s cute, you know, it’s nice. But the economics are so, so far from making sense. And yet that’s where subsidies are going now. We’re putting 90 percent of the subsidies in deployment—this is true in Europe and the United States—not in R&D. And so unfortunately you get technologies that, no matter how much of them you buy, there’s no path to being economical. You need fundamental breakthroughs, which come more out of basic research. Q: So suffice to say we will find no solar cells on the roof of the Gates residence? Gates: Oh, we like to be cute like everyone. For rich people, this is OK. Rich people can do whatever they want. "Budget reformers need to remember three things. First, this is not a political fight between Republicans and Democrats; it is a fight against 50-year trends toward statism. Second, it is a moral fight, not an economic one. Third, this is not a fight that anyone can win in the 15 months from now to the presidential election. It will take hard work for at least a decade. Consider a few facts. The Bureau of Economic Analysis tells us that total government spending at all levels has risen to 37% of gross domestic product today from 27% in 1960—and is set to reach 50% by 2038. 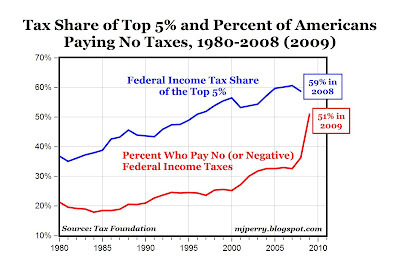 The Tax Foundation reports that between 1986 and 2008, the share of federal income taxes paid by the top 5% of earners has risen to 59% from 43% (see chart above). 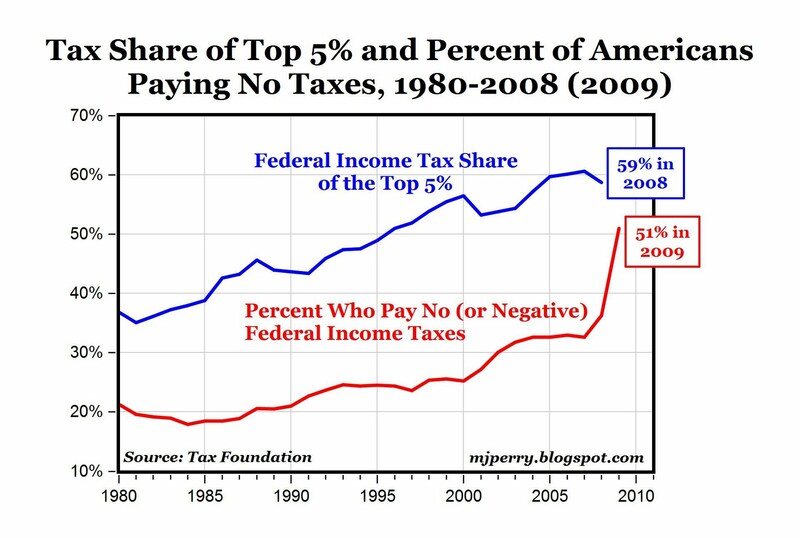 Between 1986 and 2009, the percentage of Americans who pay zero or negative federal income taxes has increased to 51% from 18.5% (see chart above). And all this is accompanied by an increase in our national debt to 100% of GDP today from 42% in 1980. In other words: Heads, the statists win; tails, we all lose. Anyone who seeks to provide serious national political leadership today—those elected in 2010 or who seek national office in 2012—owe Americans a plan to escape having to make this choice. We need tectonic changes, not minor fiddling. Rep. Paul Ryan's (R., Wis.) budget plan is the kind of model necessary. But structural change will only succeed if it's accompanied by a moral argument—an unabashed cultural defense of the free enterprise system that helps Americans remember why they love their country and its exceptional culture. Conclusion: No one deserves our political support today unless he or she is willing to work for as long as it takes to win the moral fight to steer our nation back toward enterprise and self-governance. This fight will not be easy or politically safe. But it will be a happy one: to share the values that make us proud to be Americans."